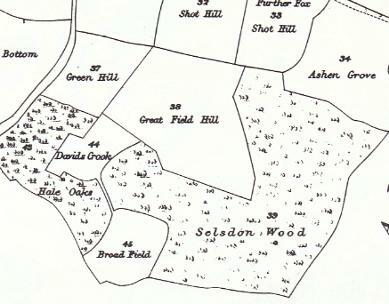 The history of the area surrounding Selsdon Woods can be traced back hundreds of years. In the 1950s Mr. R.I. Little excavated a Romano-British settlement in nearby Kings Wood, half a mile to the south-west. A small farmstead and cemetery were discovered which had been undisturbed for 2000 years. Pottery found there indicated occupation from the middle of the first century to the middle of the second century A.D. The section of Old Farleigh Road on the south west border of Selsdon Woods is an Iron Age track way to the Sussex ironfields via Farleigh, Titsey and Limpsfield Common, and in Kings Wood Mr. Little discovered 46 dene holes or depressions, thought to be marl pits. One 10 foot shaft contained Iron Age pottery. 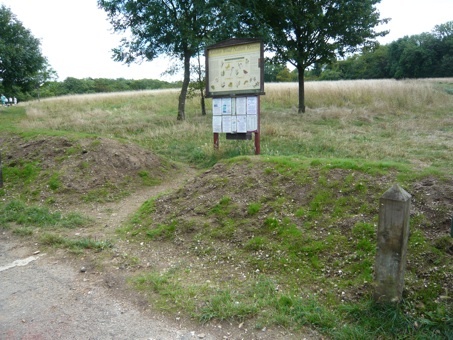 There are many lineal earthworks, which may be ancient field boundaries, similar to the mound and ditch which forms the Addington Boundary in Selsdon Woods. 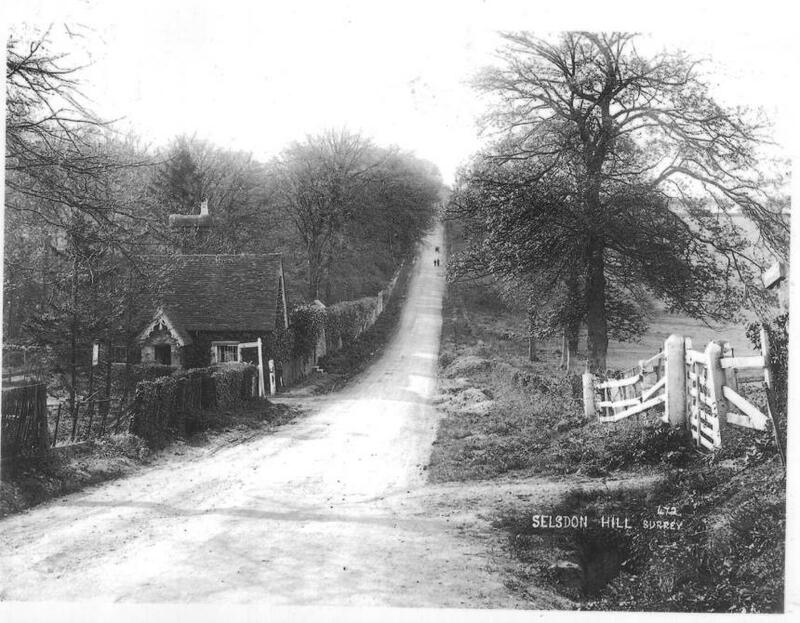 The name of Selsdon means Seli's Hill. This is confirmed in 'The Place Names Of Surrey ' (1934) and endorsed by place name authority Dr Margaret Gelling in her 'Place Names in the Landscape ' (1984). We do not know who Seli was or when he lived, but possibly he may have been a Jute, as in the very earliest days Selsdon was part of Kent. In those days Kent was divided in to Lathes or districts, running east to west and each roughly of the same size. The easternmost lathe is only half the size of the others and originally was based on a vill at Wallington. However, sometime in the seventh or eighth centuries, the eastern half of this lathe was either conquered or purchased by Surrey, and this included Selsdon. Sometime in the eighth century the See of Canterbury acquired two Surrey manors, one of which was Croydon. Croydon must have become important as a minster church was established . About this time the manor was leased to Ealdorman Alfred for life. He was probably the local governor but he made a will, which is still held in the British Library and has at times been on display. In his will he gave some of his property to his wife Waerburh - 32 hides in Sanderstead and Selsdon, as well as other property. This is the first recorded mention of Selsdon. The Croydon entry in the Domesday Book states that Archbishop Lanfranc holds Croydon in lordship. It also states that Restald hold 7 hides of this manor from the Archbishop. This probably relates to the detached part of Croydon we know as Selsdon. There are one or two references to Selsdon in a few medieval documents. In 1193 there is a reference to a parcel of land known as Wodesmannewood. There are also references to some owners of land in Selsdon such as Robert de Sanford, a Knight Templar in 1247 and in 1395 William Doo and his wife Matilda acquired some land in Selsdon. This is the year Christopher Columbus set sail across the Atlantic to 'discover' the New World. It is also the year that Archbishop Morton of Canterbury instituted a terrier or survey to be carried out to ascertain those people in the parish of Croydon who paid quitrent to the Lord of the Manor - himself. It wasn't the first such survey in Croydon, but it is the earliest still in existence. It disappeared for many years but came on to the antiquarian book market in 1923 for £52 10s, and Croydon Library were able to purchase it. Clarence Paget transcribed the document shortly afterwards and so any references are taken from his transcription. SPICERS WOOD - 62 acres - Geoffrey Ownstead owned 48 acres and there were only two other tenants. GROTTEN FIELD - 110 acres - Geoffrey Ownstead 67 acres Thos Wodden 27 acres. This field contained SOUTHEDEN and means the Great Field. A Mr Burstow of Horley had a 2 acre strip. Selsdon Wood was once part of the Selsdon Park estate. Selsdon was within the parish of Croydon from medieval times and was part of land owned by the Archbishops of Canterbury. From at least the 16th century Selsdon was largely divided between two farms, Selsdon Farm in the north (now Selsdon Park Hotel) and Ballards Farm in the south. Henry Ownstead, whose brother John owned Sanderstead Manor, held Selsdon Farm in 1584, and it remained in his family until 1660. It was then sold to Henry Bowyer, whose family held the land until the 18th century. 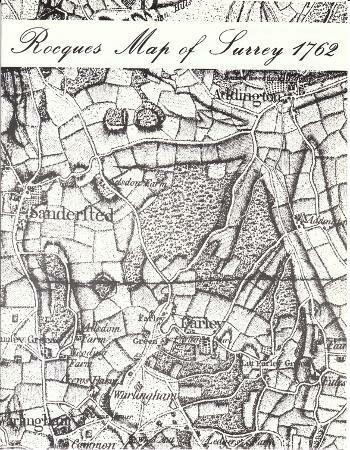 Rocque’s map of Surrey shows Selsdon Farm. The triangle in the centre of the map encloses our Wood. The buildings are situated where the Selsdon Park Hotel and Croydon High School currently stand and the adjacent triangle of land is predominantly woodland with fields to the southern tip and northern edge. There does not appear to be any settlement in Selsdon at this time apart from the farm although ‘hamlets’ are shown at Sanderstead, Addington and Farley. The Bainbridge map of 1800 (see extract right) shows ‘Croydon Crook’ including an area marked as Selsdon Wood and several other recognisable place names such as David’s Crook, Green Hill and Ashen Grove. One of the most notable differences from the present map is the absence of the plantation, Steven’s Larch (see 1890 below) and the other wooded strips that now break up what was Great Field Hill. The area marked as Broad Field is now The Gorses and it is clear that this area was not wooded at that time. Around this time there was a local naturalist living in the area called James Dickson. He was a bryophyte specialist and many of his drawings of mosses may have been based on specimens collected in our wood. See this linked page for more information about him. The estate comprising Selsdon Park, Selsdon Farm and Selsdon Woods was purchased by William Coles in 1809 but when he became bankrupt a year later it was sold to George Smith*, an MP, banker and director of the East India Company. The land was owned by the Smith family for most of the 19th century. Smith transformed the farm house into a mansion (later to become the Selsdon Park Hotel) and made many changes to the estate, building a home farm complex, two lodges, a new farm and various cottages. He also landscaped the park and re-routed the Farleigh Road to the east. There is little information about how the estate was managed but the woods would have been used for shooting and the fields probably as meadow or pasture as there is no indication that the land has been ploughed and the soil quality is too poor to support crops. In 1883 the Corporation of Croydon was created as part of Local Government changes and “Croydon Crook’ became part of the Urban District of Coulsdon and Purley. * George Smith (30 April 1765 – 26 December 1836) was a British Member of Parliament, banker and director of the East India Company. He was the fifth son of Abel Smith, a wealthy Nottingham banker, also an MP, and four of his brothers were also MPs. Smith entered Parliament in 1791 as member for Lostwithiel, and also represented Midhurst and Wendover in a parliamentary career spread over forty years. He was married to Frances Mary Mosley, daughter of Sir John Parker Mosley, 1st Baronet and they had 9 sons and 6 daughters. His memorial is in All Saints Church, Sanderstead. On 22nd September 1917 an RAF pilot, 2nd Lieut. Arthur Parry Jones was killed when his plane crashed in, or close to, Selsdon Wood. In September 1918 a young airman was killed when his plane crashed in the grounds of Selsdon Park. Second Lieutenant Arthur Parry Jones, a former estate agent's assistant, aged 19 from Colwyn Bay, was seen circling over the park one Sunday morning and firing apparently at a target. Frederick Belcher, who lived in the village, said when the machine was rather low down, it suddenly dived to the ground, where it was all smashed to pieces in the wood with the airman mixed up with the wreckage. This photograph of him was sent to FSW in 2018 by Alex Booth who asked whether we knew any more about the story. Sadly we do not, although we do understand that the land adjoining the southern end of the wood, now Elm Farm, was, at one time an airfield, which might explain what he was doing in this area. We are investigating the story and will post more here if we discover anything further. The aircraft I believe Jones was flying when he died was a French Caudron G.III, probably an E2 single seat trainer version, widely used by the RAF at that time for that purpose - it was an unarmed recon design under French manufacture but the RAF put light machine guns on theirs (likely Lewis guns) for air gunnery practice. 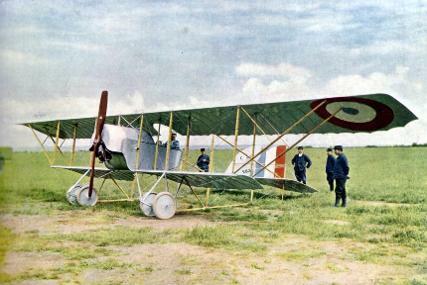 The photo shows a generic shot of the G.III as a two seat French aircraft - quite a sizeable thing. There's a preserved G.III in the RAF Museum at Hendon. Below is a record of his death on September 22, 1918 and where Jones was lain to rest. Second Lieutenant was the entry rank for the RFC at the time. A sad fatal flying accident occurred on the borders of the borough on Sunday. 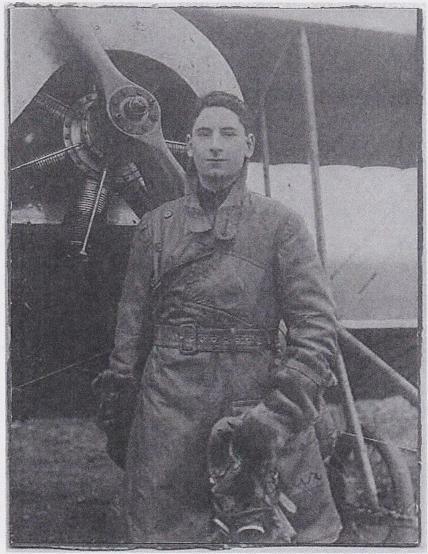 Sec-Lieut A Parry Jones of the RAF was piloting a machine over Addington ay a great height, when his machine crashed to earth, causing the instant death of the occupant. The aeroplane was smashed. The deceased officer, whose home was at Colwyn Bay, was only nineteen years of age. His body was removed to Bandon Hill Cemetery, where an inquiry was conducted on Tuesday afternoon. The Coroner for the Reigate District (Mr M J Nightingale) held an inquiry, without a jury, at Bandon Hill Cemetery on Tuesday afternoon. The deceased airman was identified by a cigarette case which was found on him after the accident. It was stated that before joining the RAF the officer was an estate agent’s assistant. Mr Willian Weetall of the Keeper’s Lodge, Selsdon Park, Selsdon told the coroner that at eleven on Sunday morning he observed an airman manoeuvring in circles. He turned round for a short while and all of a sudden there was a terrible crash. The aeroplane had fallen in Selsdon Wood. It was smashed to pieces and the pilot was dead. The machine was seen to nose-dive by Frederick Belcher od Selsdon Villas, Selsdon. The witness said he heard firing which attracted his attention to the aeroplane. Whilst a gun was being fired the aeroplane dived straight to the ground. Evidence concerning deceased’s injuries were given by Captain Iveson Russell RAMC who said the officer was out with the machine for firing practice. In the fall deceased legs were fractured and his body and head were extensively injured, the face was badly mutilated in consequence of a portion of the aeroplane having penetrated it. In 1890 Selsdon Park and farmlands (679 acres) was sold by Mabel Greville (George Smith's great-granddaughter) to William Stevens, a printer and publisher of a popular magazine The Family Herald. He is remembered for creating the plantation of conifers, Steven's Larch. On his death, nine years later the estate was sold to Wickham Noakes, a brewer, under a mortgage that remained until his death in 1923. During this period there was a grand shoot each year in November to mark Noakes’ birthday and a gamekeeper, William Westall, was employed to manage the land for shooting. Around this time Ordnance Survey maps show a ‘Pheasantry’ (where the young birds were raised) on the estate, situated on the western side of Old Farleigh Road, probably close to where Ravenshead Close now lies. On the death of Noakes, in 1923, the estate was broken up with A. E. Cresswell purchasing the land that makes up most of the present Selsdon Wood. 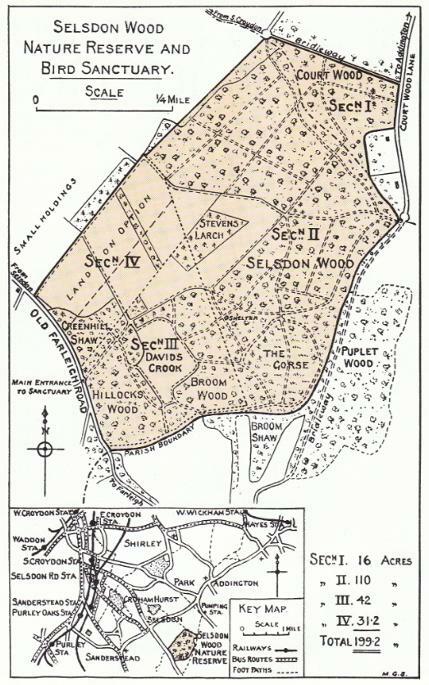 The map (above) extracted from the conveyance document is strikingly similar to the current map (although the orientation is different) and includes Selsdon Wood, Greenhill Shaw, Hillocks Wood, Broom Wood, Broom Shaw, The Gorses, Stevens Larch and four fields. However, Broom Shaw and Puplet Wood which are outside the boundaries of the present Nature reserve were also included at that time. Of the remainder of the original estate, 200 acres of parkland and the Selsdon Park buildings were sold to A D Sanderson and became a hotel, and the Surrey Garden Village Trust (founded in 1920) purchased 300 acres including Ashen Vale and Selsdon Vale. This land was to be divided into smallholdings for sale to ex-servicemen from WW1. 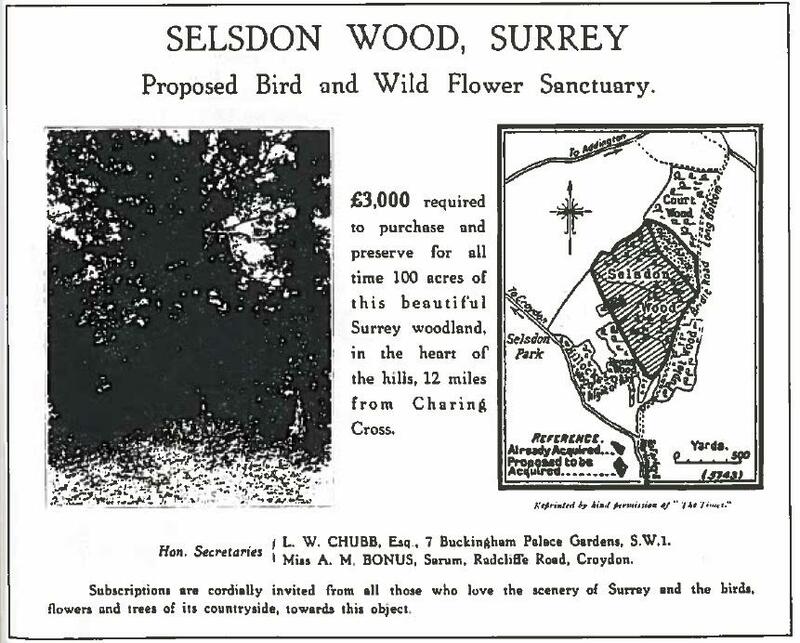 Although only one house was to be built on each plot the destruction of the original woodland had begun and in 1926 the Trust began a movement to protect and preserve the Selsdon Wood Nature Reserve before it was all given over to building land. 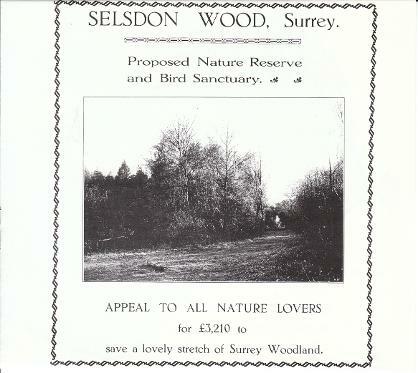 An Appeal was launched in 1925 to raise £3210 to purchase Selsdon Wood as a “Proposed Bird Sanctuary and Nature Reserve'. The map and appeal form are shown to the right. The list above shows the second tranche of subscribers - the initial list cannot be found. The appeal attracted much interest as this collection of press reports and letters show. The photograph below shows the same scene today (November 2017). The tallest larches can still be seen but those in the perimeter are now masked by broad-leaved trees (mostly Oak) that have grown up in the intervening 93 years. The scrubby nature of the grassland also makes a contrast with the fields today which are cut annually. 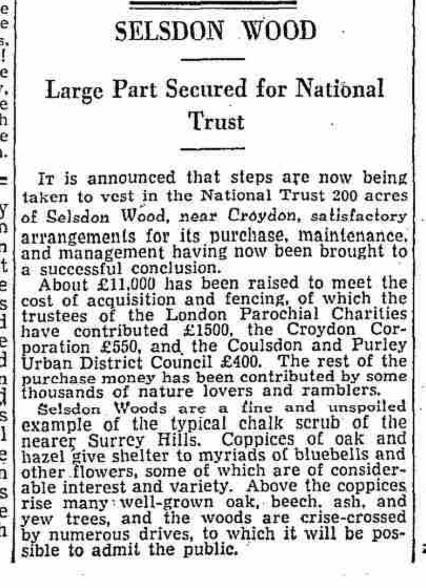 Under the terms of the appeal, ownership of the land was to be vested in the National Trust (founded in 1895) with the Corporation of Croydon and the Urban District Council of Coulsdon and Purley jointly holding the wood on a 999 year lease and undertaking responsibility for its maintenance. In order to prevent the land being sold before the money could be raised a group of philanthropists contracted to buy 126 acres of the most heavily wooded section on the north east of the site. These were Sir Lawrence Wensley Chubb, Miss Alice Mabel Bonus, Miss Winfred Mary Hudson, Mr Ernest Alfred Earl and Mr Malcolm Grahame Sharpe. All their names are on the lease of 1935 - see below. A map was produced as part of this, which is remarkably similar to the present Selsdon Wood 1930 (right). This shows the land on option, Sections III and IV, which include most of the fields, Greenhill Shaw, Hillocks Wood and Broom Wood. The map bears the initials MGS and was thus presumably produced by Malcolm Grahame Sharpe. This series of 3 artciles by Mr A Beadell was published in the Croydon Advertiser in 1927. The first one, Wild Flowers of the Woods, cites many species which have not been seen in the wood in recent years, although the Herb Paris is still to be found close to the old Yews in Court Wood. This boundary marker - which reads 'Croydon Borough 1928' can still be seen in the wood. It is set into a bank of flint marking the borough boundary which appears as a dashed line on the Appeal map on the south eastern side of Court Wood (Section 1). One visitor to the woods recalled 'beating the bounds' as a choirboy 50+ years ago. We would be interested to hear more about this and about the significance of the date 1928 on the marker. As the appeal of 1930 had still not reached it's target, a group of local residents came up with a novel idea to raise further funds. 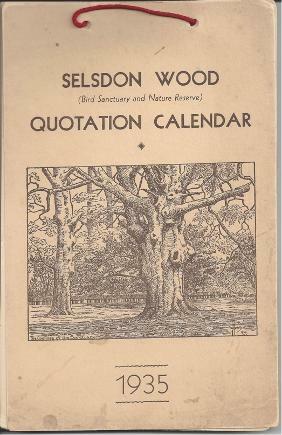 They produced the Selsdon Wood Quotation Calendar. Residents paid 1/- to have their favourite quotations included and these were set out week by week on a separate page. Mr Hector Hutt prefaced each month with a brief paragraph of nature notes in italics. The front cover is shown here and the 1930 appeal map (shown above) was used for the back inside cover. The Calendar was priced at one shilling and 750 copies were sold raising £24. One copy of the Calendar still exists and the owner, Ted Frith, has generously allowed it to be scanned for inclusion here. The high definition file is very large (40MB) but a 1.7MB version, which is still readable, is available from the link below. If you would like a high definition copy please get in touch with the Friends and we will be glad to supply it. This article (right) in the Scotsman Of Tuesday June 4 1935 reports on the completion of the project. The full page is available below - the article is at the bottom of column 4. It is not known why such a far-off publication should have an interest in Selsdon Wood. (7) to make bye-laws for the land in consultation with the National Trust. 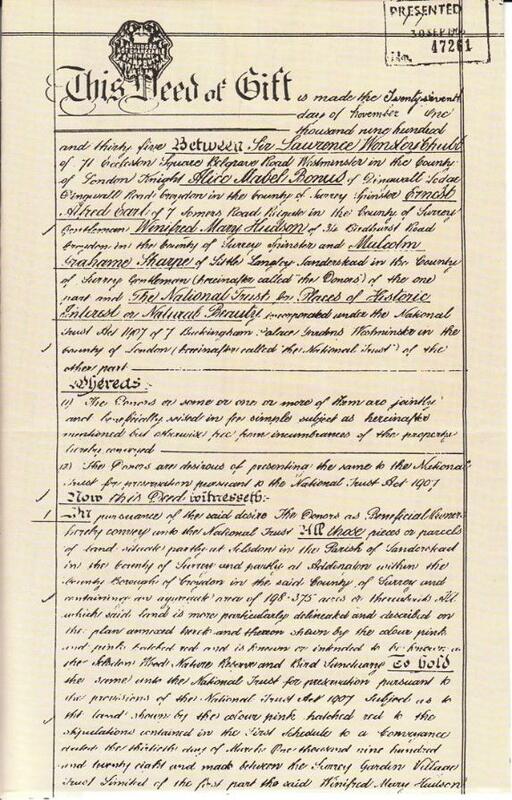 A Deed of Gift (right) was made in November 1935 in which the owners (see 1925 above) formally handed the land over to the National Trust. 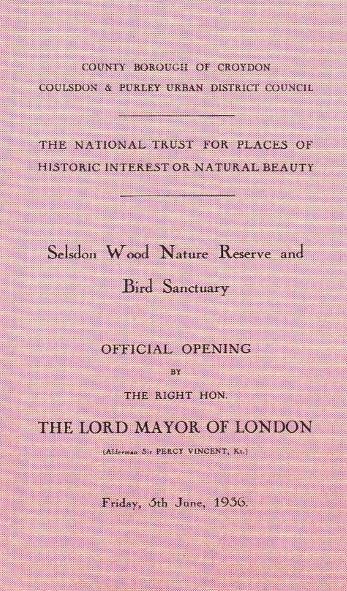 On 5th June 1936 Selsdon Wood Nature Reserve and Bird sanctuary was offically opened by The Lord Mayor of London, Sir Percy Vincent, (who lived in Purley). Unfortunately the planned opening in the wood was cancelled as the paths were too muddy so the main event took pace at the Town Hall where over 250 guests attended the ceremony. Local Guides and Scouts provide a Guard of Honour and the Band of the 3rd King’s Own Hussars sounded a fanfare of trumpets. 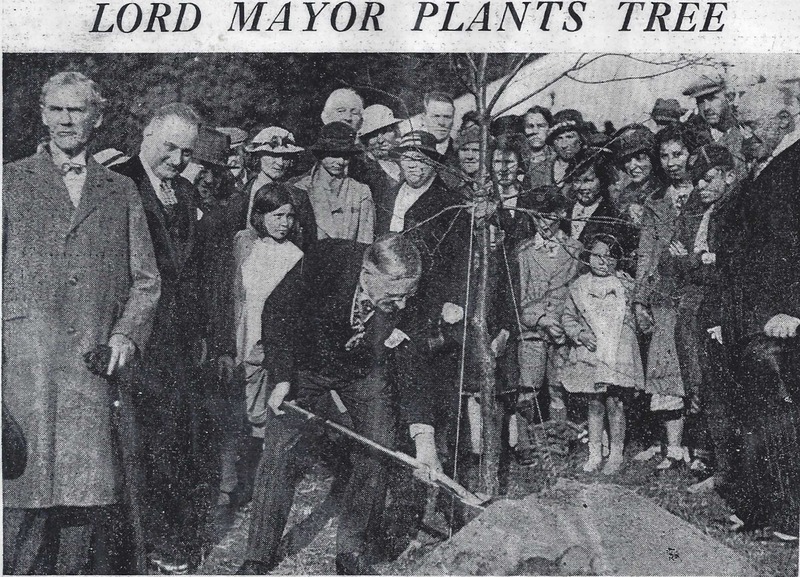 Later The Lord Mayor visited the wood and planted a tree as showing in the above photograph. One of the major paths, Vincent Avenue, was named in honour of Sir Percy Vincent. See the contemporary press report (right) for a full account. A Management Committee was established with 3 members from each of the local authorities and 3 from the National Trust and 2 new keepers were appointed. Increased regulation included the closure of private gates from smallholdings and bylaws banning horse-riding and an ongoing programme of maintenance work was begun, including repairs to fencing and paths and coppicing. At the official opening visitors were invited to inspect the Memorial Bird Pool “kindly presented by Col. H.S. Wood, I.M.S.and Mrs Wood, of Kensington”. It appears that Lieutenant-Colonel Wood first suggested putting up a Bird Bath and Drinking Fountain as a Memorial to himself and Mrs Wood in correspondence with the Royal Society for the Protection of Birds in 1930. Lt. 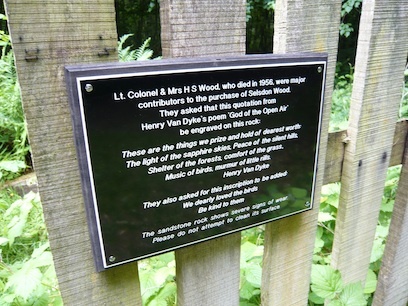 Colonel & Mrs H S Wood, who died in 1956, were major contributors to the purchase of Selsdon Wood. Music of birds, murmur of little rills. The sandstone rock shows severe signs of wear. Please do not attempt to clean its surface. The photograph below left shows the pool in the 1950s when it was fenced and had an adjacent bird table. The fencing was stolen and later the replacement wood fencing knocked down by dog walkers who thought the dogs should have some water source. 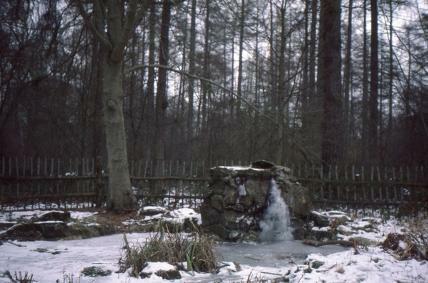 The one below right shows the bird bath and pool in Linden Glade as it was in winter 1986 when it froze. The bath was originally fed by mains water but this was cut off some years ago as it was considered too expensive to maintain. During 1939-45 the Woods played their part in the War effort in several ways. In the spring of 1942 the Great Field was ploughed by the Surrey War Agricultural Committee, with the help of Italian prisoners of war. That area also served as a decoy for Biggin Hill airfield and dummy tanks were placed with their guns protruding from the trees. Much heavy timber was taken during the War and in the summer of 1944 many of the trees in Stevens' Larch were cut for pit-props by the Ministry of Supply. Some replanting took place in 1948 and 1952. On 15th August 1940 bombs were jettisoned into the Wood leaving craters. Several of these can still be seen throughout the Wood, the largest of which is probably the one in Steven's Larch near to the Centenary Plantation. The link below is to an eye witness account of this event by Andrew Harris. All the bombs that fell in London between 7/10/1940 and 06/06/1941 have now been mapped and this map includes our wood see http://bombsight.org/?#14/51.3299/-0.0428. However, this period does not include August 1940 which may explain why the many hollows toward the centre of the wood (that I have always assumed to be bomb craters) are not marked on this map. 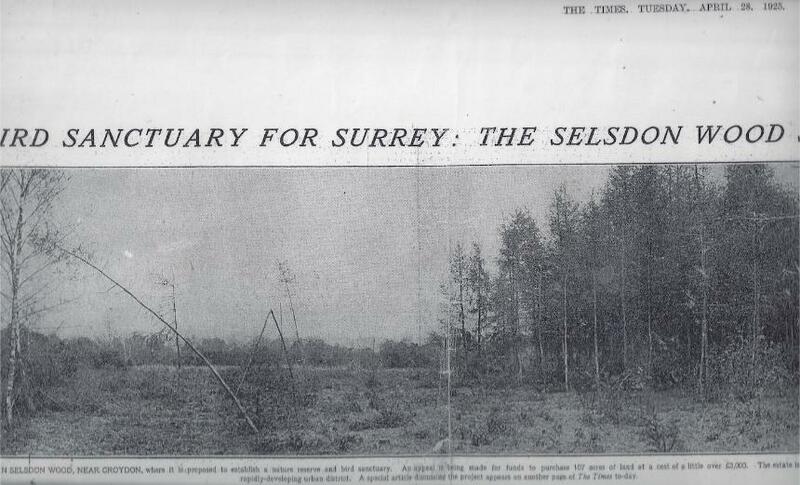 In 2015 the FSW received a communication from Chris Jennings who was a child in the 1950s living in a road called Selsdon Vale which flanked Vale Border. This was before the Selsdon Vale estate was built. He recalled playing in Selsdon Wood and escaping from the two keepers (who carried shotguns) through a hole he had dug under the fence. Click here to read the full memoir. A further memoir was sent in by Steve Glover in 2016. He too had lived in Selsdon vale in the 50's where his father kept pigs and chickens on a smallholding called Ifra Tors. This provides another snapshot of a life very different from that of children today. Steve obtained a 1956 OS map of the area showing Ilfra Tors (grid ref 623/361). He estimates that the present day Goldfinch Road, Peacock Gardens and Lapwing Close now border the land. Click here for Steve's memoir. The map is attached below in two formats. The first is the full map and the second shows it as two separate pages but is a little sharper.Depending on your browser you may need to download the first map to rotate it to the correct orientation. The photograph above is believed to be the original shelter. It was supplied by Clive Ford who told us it was taken by his father in the 1960s. A caption on the back reads: 'Advertiser Centenary Photographic Competition. Photo entitled "Selsdon Bird Sanctuary" Submitted by Mr R W Ford, 55 Queenhill Road, Selsdon Near South Croydon Surrey'. The competition was held to mark the centenary year of the Croydon Advertiser. 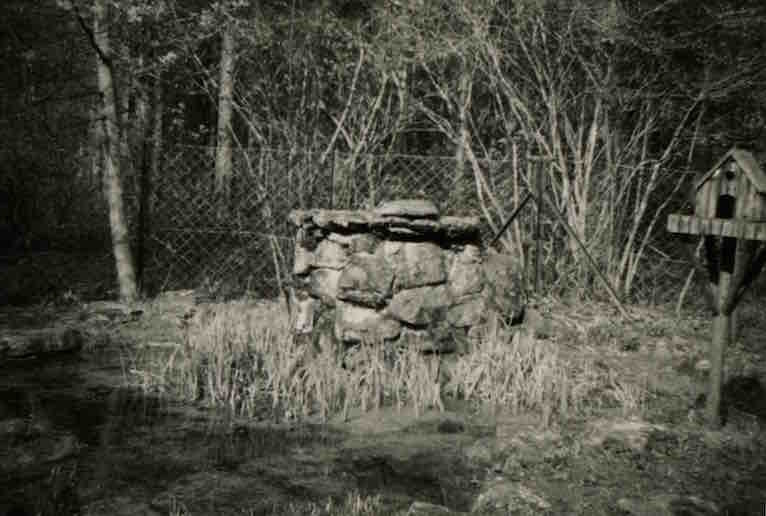 The shelter burned down some time in the next 15 years and was replaced in 1973 by a brick structure - see below. This information comes from an article in the Selsdon Gazette, September 1962, written by Douglas Thornton. (The full article is available from the link below.) The same article reports that there were 2 drinking fountains in the wood at that time, one near the hut in David's Crook and the other near the Yew Tree Way gate. The remains of the David's Crook fountain are still there and the plinth that held the Yew Tree Way fountain is still there beside the gate. The fountain that was once inside Yew Tree Gate was installed on 25th March 1957. It was one of several thousand installed by the Metropolitan Drinking Fountain & Cattle Trough Association with contributions from the Addington Smallholders during 1956. It would have looked like one of these: http://www.mdfcta.co.uk/fountains_156.html. With reference to the May 2017 newsletter article:-The History of Selsdon Wood, I lived close to Selsdon Wood and approached it from Selsdon Park Road via ‘Pigs Alley’ for a number of years entering via the Yew Tree Way gate which overnight was locked. The drinking fountain was an elaborate stone structure that you stood up to and caught the spout of water in your mouth. It was positioned a few feet to the left close to the sign board as you entered the gate. I was 14 years of age in 1957 and lived weekends and holidays in a part of the Sanctuary our group regarded as their own. The water provision was very useful for us but failed to provide water for very long. It suffered worsening vandalism and was removed at some point. My connections with Selsdon Wood came when we moved from wartime accommodation in the Black Mountains of Herefordshire to our new home on Monks Hill Estate. My father was born and brought up in Shirley and came to know these woodland areas well as a youth and older. I have always retained a great admiration for woodlands and whilst living in the area used the Sanctuary and Littleheath Woods as my play/exploration area and as a sanctuary for my thoughts since then. A point of potential interest told to me by my father was that the first live radio broadcast of a nightingale singing was recorded from Selsdon Woods. I wonder if this is correct? However, the link below seems to suggest that it wasn’t actually our wood - although it was pretty close in Oxted. Of course I don’t know how reliable this is but it does seem pretty detailed and if they really did need all that setting up it would have been easier in a garden than in a wood. "During the nesting and flowering season it is not feasible to allow unrestricted access but at other times the public are free to roam at will. There are several miles of sheltered footpaths, most of which are always open to the public." The article also gives this report of the management carried out in 1961/2. "The Management Committee have met on two occasions during the past year, one of these being their annual visit to the wood in May. Foxes, 43; Grey Squirrels, 101; Jays, 43; Magpies, 37; Crows, 6; Pigeons, 41; Stoats, 2; Weasels, 6; Rabbits, 137. The Wood is well used by the public, organised bodies and parties of school children in the charge of school teachers. Assistance and encouragement is given to organised parties to visit the Wood, and keepers are notified of any such visits. A car park for use by visitors to the Wood is being constructed near the 'Greenhill' gate entrance on the Old Fareligh Road frontage." Selsdon Vale and Forestdale estates were built. Town Planning regulations stipulated that a buffer of open space should be left to protect the woods. The area on the Selsdon Vale side, Fox Shaw, (see map below) is 150 feet wide and has been acquired by the local authority although it is outside the boundary fence of the wood and is not part of the National Trust property. On the Forestdale side the ‘open space’ is now mainly formed by the gardens of the adjoining properties although a strip of woodland beside the bridleway to the north has been purchased by local residents but left as unfenced woodland. In 1965 the reorganisation of Local Government amalgamated the two councils into the London Borough of Croydon. 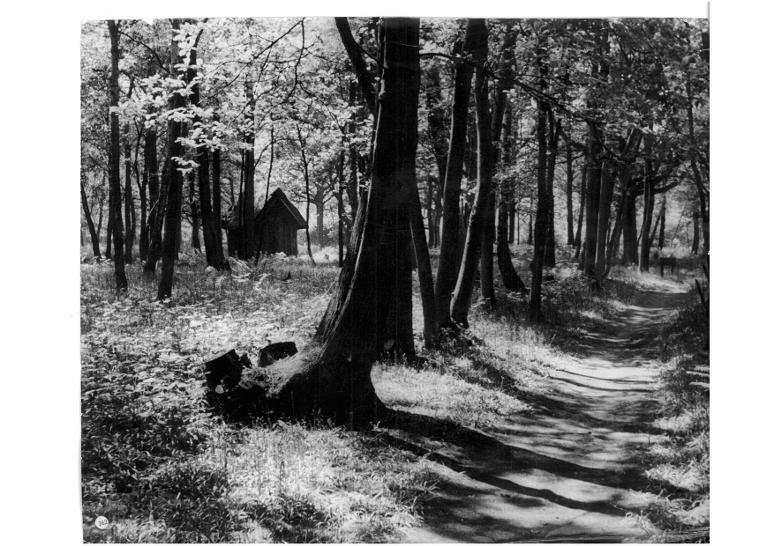 Demand for timber in wartime and post war building had resulted in many areas of the wood being reduced to a scrubby thicket with poor tree coverage and consequent limited wildlife. A complete survey was undertaken by the new authority and replanting was recommended. The first section was replanted in 1969. Over the next 25+ years beech, oak, sweet chestnut, larch and Norway spruce were planted throughout the wood with the coniferous planting mainly in the early years. To maintain the flower rich chalk grasslands, the five meadows were cut annually by a local farmer who was paid for the work by keeping the hay for his animals. This photograph entitled 'Taking a Hay Crop from One of the Meadows' comes from a book called "Croydon Parks - an Illustrated History". 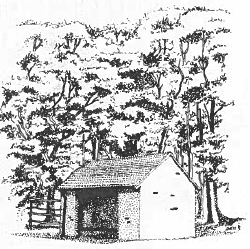 A brick shelter was built in the south eastern corner of David's Crook to replace the rustic thatched shelter that was burnt down (see 1957 above). Like it's predecessor, the shelter was dedicated to the memory of Malcolm Sharpe (see 1925 and 1957 above). It stood until 2008 when it too was burnt down by vandals. The wreck was cleared by LB Croydon the following year. 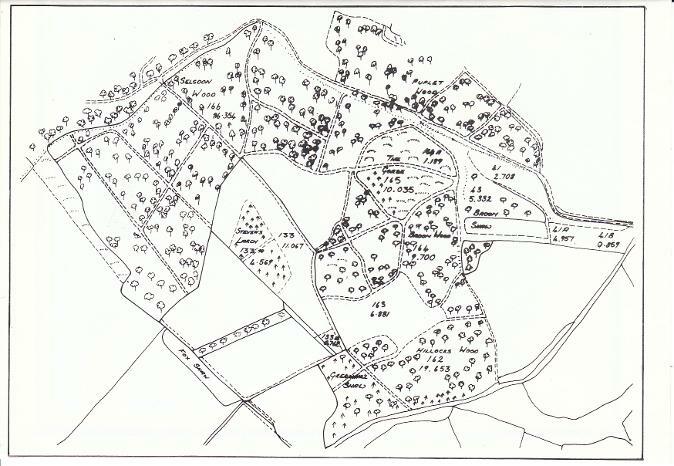 The LB Croydon Parks Department published a map in 1974 showing the areas newly planted since 1968. These included Steven's Larch, Greenhill Shaw, the Gorse area and the region near the Gorses on the other side of The Wend. The map also shows 3 Special Sanctuaries and the new housing developments surrounding the wood with the Fox Shaw buffer zone marked. The Jubilee Plantation was created to celebrate the Queen’s Silver Jubilee. This includes oak and beech and was funded and planted by the Croydon Girl Guides. 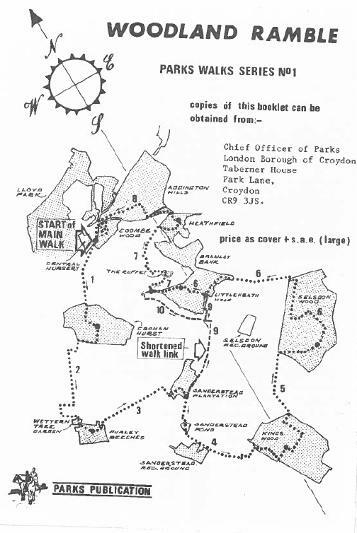 In the same year LB Croydon Parks Department published a pamphlet 'Woodland Ramble' describing a walk through a number of the local parks and woods including a section on Selsdon Wood. The Maruje Dale Plantation was created by a group of young people on a Youth Opportunities Scheme organised by Gordon Alexander of Croydon Council Parks Department. The name of the plantation was made up from the names of those who took part. During their training they covered coppicing and maintenance work and they were taught how to make benches and bird boxes with the wood. New trees were also planted - mainly beech. 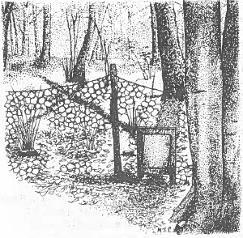 The plantation was protected by rabbit-proof fencing but a gateway was made for badgers to allow access along their well used tracks between the set and feeding grounds. This had a sprung gate, heavy enough to prevent the entry of rabbits but allow the larger, stronger badgers to pass freely. The Centenary Plantation was created to commemorate the centenary of Croydon Council. One hundred English Oaks and Birch trees were planted with the intention that the Birch would be felled when the Oak had matured. 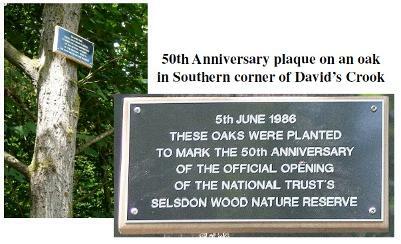 Three oaks were planted by the Mayor of Croydon in the Southern corner of David's Crook to mark the 50th Anniversary of the Official Opening. A plaque marks the site. This photograph of the event (right) was originally published in the Croydon Advertiser. Many thanks to them for permission to use this image. 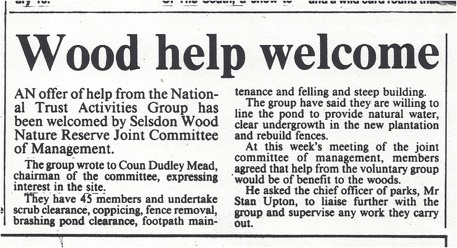 This piece from the Croydon Advertiser of January 1987 highlights another contribution from a volunteer group - The National Trust Activities Group. It is not known for how long this continued but there was no long term voluntary activity in the wood in 1987. At this time two keepers were employed and their duties included patrolling, pest control, care of toilets and car park, as well as forestry. The first Forestry Show, as it was then called, was held in The Great Field. 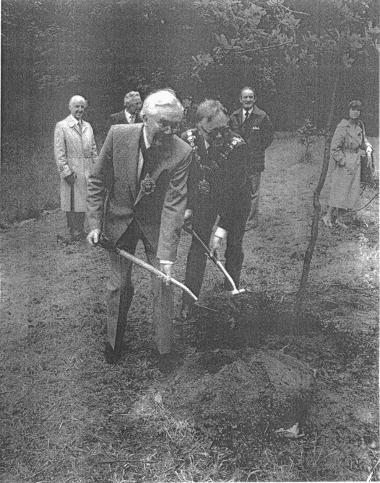 The purpose was to show off the Council's new equipment and to explain what actions the Council were taking after the storm of 1987 that had brought down so many trees. The bear that stands beside the car park was carved in the first year (1988) as a spectator event during the show. It was carved by a local tree surgeon, Selwyn Smith who now lives in Wales. The link below is to an article by Roger Yates, the Show Organiser, which gives much more detail. This was published in the September 2016 issue of The Selsdon Gazette. 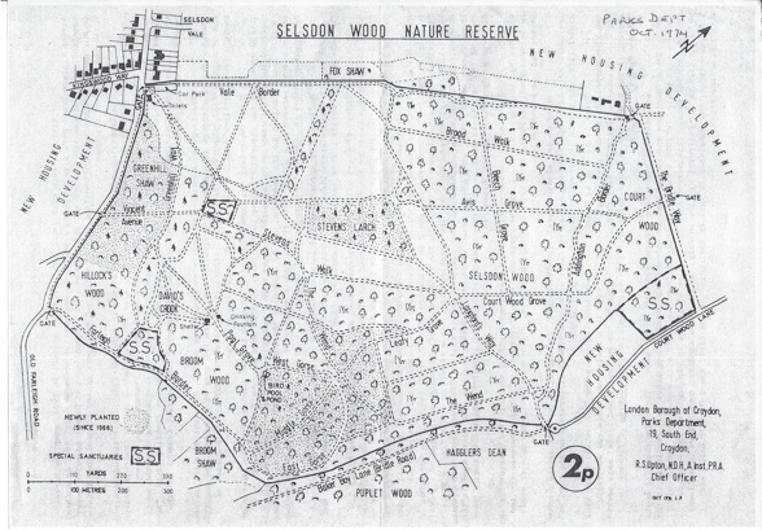 A booklet, ‘Selsdon Wood Nature Reserve - An Illustrated History’ was published to celebrate the 50th Anniversary of the Opening of Selsdon Woods in 1936. Most of the maps and other illustrations on this page are taken from this booklet. 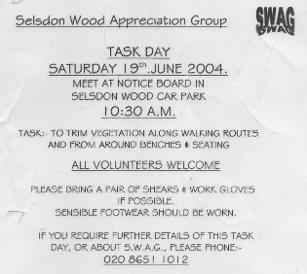 A support group, SWAG, the Selsdon Wood Action Group, was set up. The constitution was drafted at meeting on 8th November 2003 following an inaugural meeting held possibly in September/ October that year. It is not known for how long SWAG was in action. Please get in touch if you can tell us more. 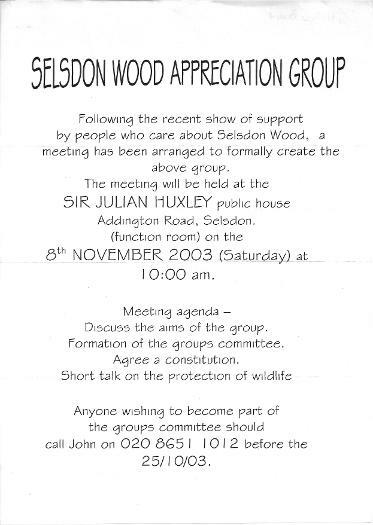 The Friends of Selsdon Wood was founded by Dawn Gibbons (who had also been involved with SWAG, which had folded. The inaugural meeting was held on 12th November at the Julian Huxley, Selsdon. The event was attended by 12 people including Ernie Thomason, the Park Ranger, Meike Weiser, the Community Partnership Officer and Sara Bashford, the Selsdon Councillor responsible for Woods. There was also a representative of Selsdon Residents Association attending. At this meeting it was agreed to set up a Friends group to maintain and promote the wood. 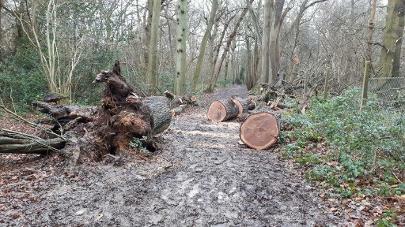 The Friends of Selsdon Wood obtained grants to purchase name boards for the woodland paths - £500 from the London Tree & Woodland Grant Scheme and £500 from the Selsdon Residents Association. The Friends added £75 to allow the first two phases of the project to get under way. For more information and photos see the Projects page. The FSW also did some clearance work in the Jubilee Plantation and planted 250 mixed whips. For a full account see the Areas of Interest page. The 75th Anniversary of the opening of Selsdon Wood as a National Trust Nature Reserve was celebrated with a charcoal burn over the weekend of June 3rd, 4th and 5th. A similar event was held in May 2012. Details of these charcoal burns can be found on the Events page. On 3rd March groups of Brownies and Rainbows planted 60 trees in the Jubilee Plantation to celebrate the Queen’s Diamond Jubilee. See Areas of Interest page for photographs and more information about this event. On 7th August the Friends of Selsdon Wood installed a new seat at the top of Green Hill, donated to commemorate the establishment of the FSW in 2007. We also attached a lost property box to the notice board in the car park. A dedicated bench was also installed this summer in Field 2 in memory of Heather Creamer, a lover of Selsdon Wood, who died in December 2012. In the summer of 2014 Croydon Council installed raised banks around the car park area. These are called soil bunds and replace the wooden posts that had largely rotted away. Their purpose is to prevent the possibility of invasion of the woods by travellers or other vehicles. They are better deterrents than posts (which can fairly easily be knocked down by a determined intruder) and are also a more permanent solution to the problem. They looked a bit messy when first built but they soon grassed over and in future years will be mown at the same time as the field paths to keep them neat. The photograph shows the soil bund on 16/8/14 - only 2 weeks after completion and seeding. The Council installed two new bins in the car park - part of a programme of renewal of 130 bins borough wide. 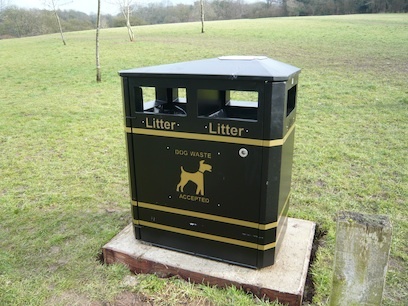 These have no separate slot for dog poo - it all goes in together - and there is a cigarette stubber on the top. It is hoped that the slot is narrow enough to prevent the dumping of household waste and to stop foxes raiding the bins and spreading mess. So far this has proved to be the case. In 2014/15 FSW undertook the renovation of the notice boards at the 6 entrances to Selsdon Wood. They had been up for 20 years or so and contained out-of-date information and had also been damaged by graffiti. Although the boards were Council owned they were unable to fund any work on them in the current financial climate. The FSW were able to obtain grants to cover most of the cost and in February 2015 the first completed new board was erected in the car park. The project had taken 18 months. For a full report see the Projects page. On 25th March we had some unwelcome visitors - 3 travellers' caravans in the car park, It was reported to the police and Council who were aware of them as they had previously been in Selsdon rec. then Selsdon Park Hotel staff car park. They were moved on by bailiffs on 27th March. They had made a bit of a mess but it was cleared by the following day by Council contractors and the FSW. A height barrier was installed at the entrance to the car park by Croydon Council to try to prevent any further invasion by travellers. This was part of a programme of similar installations throughout the borough. During the month of April five new benches were installed in the wood by the FSW. Two were to replace old benches that were rotten and three were dedicated benches in new locations. 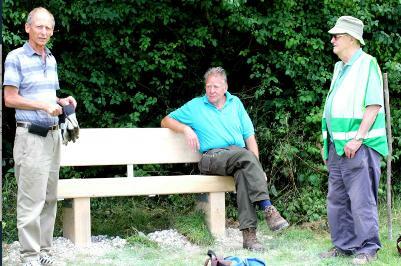 The latter comprised benches dedicated to the memory of woodsman Rob Sowter and to Janet Bickerstaff (a founder member of the FSW), both presented by the FSW, and a bench for G G Lewis presented by his friends and family. For more details and photographs see the Projects page. A further 3 dedicated benches were installed in the autumn of 2015 to commemorate the lives of Michael Boyd, Vera May Cannon and Jan Stupes Martin. All were presented by the families of the deceased. Full details can be found on the Seats page. In June 2015 new nesting boxes and plaques were installed by FSW. These included bird and bat boxes made by Jim Dunning and plaques in Linden Glade (see 1936 above) and The Gorses. Contractors for the Council started work on this on Saturday 22nd August 2015 and by Tuesday 1st September the internal work was completed. All internal walls were painted white, the floors resurfaced in grey and external doors painted green. The door to the Ladies was replaced as it was very rotten at the base. FSW had to move out of our store to allow it to be painted and all our resources were relocated temporarily to the garage. They were returned to the store on 3rd September. On completion of the work the FSW applied to Croydon Council for a licence to make use of the "mess room" which had been largely unused since there ceased to be a full time warden. Thanks to funding from the local Councillors' Ward Budget we purchased a display board which is installed in the mess room and bears a series of displays linked to events and walks. These displays also include a "museum" of items found in the wood such a the skulls of various mammals. 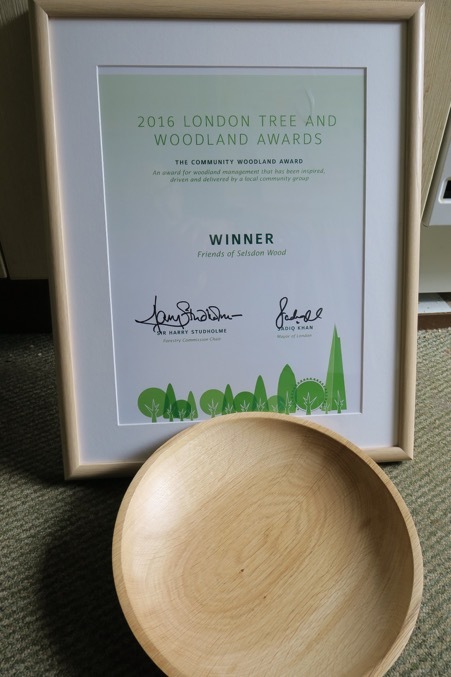 The Friends of Selsdon Wood were delighted to receive an award from the Forestry Commission for being a community group that works effectively to protect and develop London's trees and woodland. The group was nominated by Mathew Frith of London Wildlife Trust and attended an event at London City Hall on 26th May 2016 to receive the award. Click this link for full details of the nomination and an account of the ceremony. In 2016 the FSW held several additional workdays to clear and restore the pond in Linden Glade and to create a wooden henge to replace the broken down fence. Unfortunately the pool sprung a leak in the following year which we were unable to cure. Full details of this work with photographs can be found on the Projects page. Over the period of 2016-17 the FSW laid woodchip and gravel to improve the quality of many paths and get rid of the worst muddy puddles. Full details of this work with photographs can be seen on the Projects page. In the autumn-winter of 2016-17 Council Contractors undertook a substantial amount of felling and clearing in The Wend, Leafy Grove and West Gorse. See the Management page for further details. This attracted much negative comment from users of the wood at the time - and indeed the state of the paths was grim after contractors vehicles had ploughed them up. However the following spring the newly opened up rides were resplendent with bluebells and very pleasant places to walk in the spring sunshine - see photograph. In the winter of 2016-17 a burst pipe in the roof of the toilet block brought down the ceilings in the Ladies and Gents and damp cause substantial peeling of paint and growth of mould. This was repaired in the summer of 2017. Present were:- John & Linda Zareba, Lee Lee (past treasurer), Linda Morris (current secretary), Karen and Neale Fox, Ted Forsyth (current vice-chair), John Bickerstaff, Christian Kuepers, Dawn Gibbons (founding chair), Heatehr Govier (current chair) and Ernie Thomason (former park ranger for Selsdon Wood). Storm Eleanor blew down a huge Oak tree on Farleigh Border. 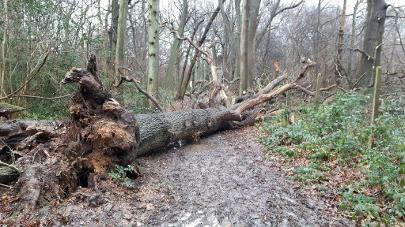 The tree was entirely blocking the path and was much too big for the FSW to deal with so we reported it to the Council who had it cleared the very next day. Measurements of the girth of the trunk suggest that the tree was around 120 years old. Five new seats, purchased in early 2018 were set in place in late spring once ground conditions were suitable for their transport to the sites. Our workdays team, assisted by others, had prepared all the holes and added soil to secure the benches once they were in place. One of the old replaced seats was deemed repairable and taken away for repair. A full list of all the dedicated seats and benches in the wood can be found on the Seats & Benches page of this website. 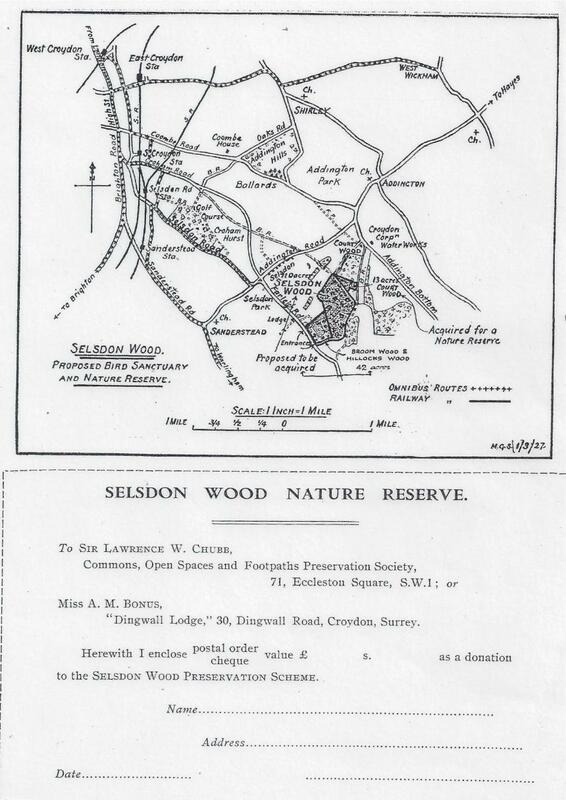 Ted Frith has written an article, The History of Selsdon Wood Up to 1945, which gives more detail than we have provided on this page. He has generously made it available to us and a copy may be downloaded from here. 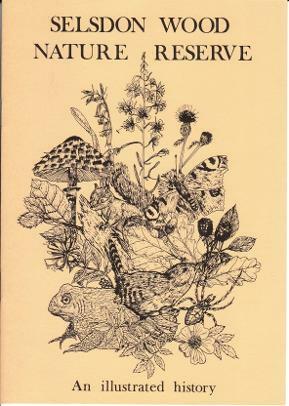 Janet Bickerstaff wrote a Project in 1986 for the Open University Changing Countryside Course on the History and Management of Selsdon Woods. She kindly gave permission for us to publish this and a copy may be downloaded from here.